Me and a couple of other users (according to reviews and personal friends) keep ending up stuck on the loading screen. The blank dog is moving but the loading bar never appears and even after twenty minutes and several reopenings. This is something new for me, so I'm pretty excited! The game is super cute and I can see it has a lot of potential for being a game I could spend a lot of time playing. My name's Andrew! I'm a 24 year-old Trans dude living in Alabama. Some of my favorite things include wolves, Pokemon, Game of Thrones, The Walking Dead, storms and coffee! I'm a furry, Therian and am legally blind. Feel free to ask anything you like! My name is Pippi, I'm 19 years old, and I never learned how to read. I just found this app yesterday night and made a pet I wasn't happy with, I couldn't figure out how to edit her so I made a new account but I used my work email and I can't change the email address for some reason. Is it possible to deactivate a Pixel Petz account? I know I made a forum about glitches, but this one seems a little important so I’m making a separate page for it. Today someone posted a judgemental comment on one of newest pets, Kabuki. So then I replied, and then afterwards blocked them. I realized after I did so, I could not see their comment anymore. 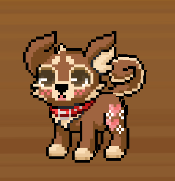 Hi, I really love Pixel Petz, and I'm probably going to be playing this game for a long time, but I do have one small problem. I had three of my Petz put in the daily show for April 7th, but once the show ended and I went to check the results to see how my Petz did, the only recent one that shows up is the show from the 5th. And if there's a current show as of today, it doesn't show up as an option in the voting section and I'm not able to put any other Petz into any other daily showz that have happened because I haven't been able to retrieve the initial three from the one that was on the 7th. I'm not entirely sure what's going on or what might have caused my game to glitch like this, but uninstalling and reinstalling and signing back in hasn't helped and I'm not sure what else to do on my end. If it helps in any way, I'm playing the game on an Android phone, the Moto z Droid, and it's fully up to date, and my username in game is Taako. Another small thing I've been noticing, and this isn't a huge issue really just an odd hiccup I've noticed, is that occasionally when I send a pet on a job, if I choose the Secret Santa job that takes an hour, sometimes the game switches the time remaining from 60 minutes to 60 seconds. I still get the full amount of experience and coins, but it is kind of a weird thing.